The importance of coordination among regional financing arrangements (RFAs) to strengthen the global financial safety net (GFSN) has been well established. The number of institutions offering adjustment lending requires some coordination to mitigate duplication and strengthen effectiveness. However, too little attention is given to the outcome of adjustment such that adjustment of one country does not unduly impair prospects of other countries or regions. This fundamental principle of avoiding a beggar-thy-neighbour approach represents one of the most important rationales for seeking close coordination of RFAs. Yet, it remains elusive. The notion of adjustment without resorting to measures destructive of national and international prosperity is missing in the deliberations of the current debate about cooperation among the IMF and RFAs. It represents a critical principle of avoiding beggar-thy-neighbour policies. The adjustment of the Euro Area appears to exhibit a high incidence of beggar-thy-neighbour effects. Following the 2010 Euro Area crisis starting with Greece, the Euro Area adjusted first gradually and then more vigorously through a significant shift in its current account balance. The Euro Area’s current account moved from balanced in 2009-11 to a surplus of 0.54 percent of world GDP in 2015-17. 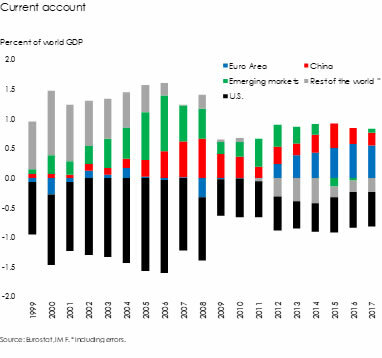 This significant increase was accompanied by a decline in the current account surplus of emerging markets excluding China from 0.30 percent of world GDP in 2009-11 to a deficit of 0.04 percent of world GDP in 2015-17 (Chart). The Euro Area rather than opting for intra-Euro Area adjustment and exhausting existing intra-Euro Area imbalances, shifted the burden of adjustment to third countries and in particular emerging markets. The Euro Area has sharply increased savings while emerging markets were forced to dissave. Its expansion occurred to the detriment of the rest of the world and risks stalling as emerging markets may be finance constrained to sustain incurring external deficits. While the U.S. may increase its deficit amid a more expansionary fiscal policy, high U.S. public debt may diminish prospects of larger U.S. external deficits. Similarly China may reduce its external surpluses to becoming a net debtor but this seems unlikely amid China’s economic development cycle. The type of Euro Area adjustment is therefore unlikely to be sustainable. The importance of close cooperation between the IMF and RFAs is to avoid a Euro Area-type adjustment. The Euro Area adjustment occurred, as is well known, within IMF-supported arrangements. The call for cooperation among the IMF and RFAs therefore may not be sufficient to ensure negative international spillovers from adjustment are contained and necessitates a more vigorous reassessment of the principles of adjustment itself. The regional focus of RFAs requires a multilateral perspective to ensure that one region does not diminish prospects of another. Avoiding beggar-thy-neighbour policies ought to remain a key objective for extending external assistance. International adjustment outcomes therefore need to form an integral part of adjustment itself. Outside the multilateral framework this will be even more difficult to achieve. 1 The GFSN comprises international reserves, bilateral swap agreement, regional finance arrangements, central banks international reserves, IMF resources. 2 The AMF was established in 1976 and the FLAR in 1978. 3 For an overview of the GFSN discussion, see e.g. IMF, Collaboration between regional financing arrangements and the IMF, IMF Policy Paper, 29 June 2017.